Four Seasons Hotel Marrakech – Save Now! 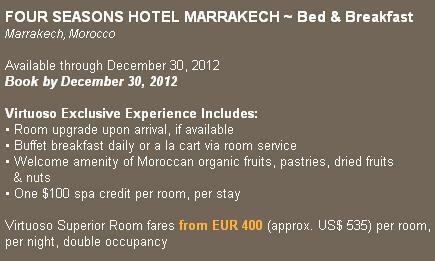 Call 1.800.330.8820 or click here to have a Morocco Travel Specialist contact you about a Marrakesh luxury vacation . Mention promo code:VNL. ~ by travelwizette on December 14, 2011.